An eye-catching website design is just the first element in building a successful web presence. 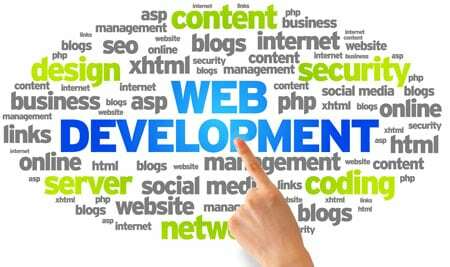 Before the web marketing starts, it is important to choose the best web development environment. What is the Best Web Development Platform? The majority of web companies seem to specialize in particular platforms. We regularly run into WordPress designers, Joomla specialists, or Magento ecommerce experts. The problem here is that, regardless of your actual requirements, these companies will naturally persuade you that their chosen development environment is best for your web requirements. They will then spend your time and your money trying to shoehorn you into their solution. WordPress CMS: WordPress is a relatively simple environment with great flexibility and thousands of plugins to extend the functionality. If your requirements are relatively simple, or you need an on-site blog, then WordPress may be your best solution. In some cases it can even be the correct choice for ecommerce websites, though dedicated ecommerce platforms tend to offer better options.You can read about the pros and cons of WordPress as a content management system. Ecommerce: If you want to build an online shopping experience, a specialized ecommerce system is usually the best option. Denver Web Success has experience with a number of systems, including Pinnacle, X-Cart, ShopSite, and Magento. However, we typically now concentrate on the flexible, open-source OpenCart system.The exception to this is the situation where additional WordPress functionality may be required, in which case Denver Web Success will recommend the WooCommerce WordPress plugin. Custom Coding: If this is to be a marketable website and you are in a competitive online market, then we should really consider custom web development. Many of the websites that we develop take this approach because it allows us to create streamlined sites with the best possible search engine optimization. During our website services client engagement process we will discuss your requirements in detail and recommend the best solution for your business goals. Denver Web Success is a web design firm that you can trust. Concentrating only on the Denver Colorado marketplace, Denver Web Success places great emphasis on personal service to provide top-quality web sites to our clients. Denver Web Success is your best local resource for website design, development, and marketing. Call 303‑800‑0801. Denver Web Success went above and beyond to make sure we were happy with the final product at every turn. Copyright © 2019 Denver Web Success LLC. All Rights Reserved. 303‑800‑0801.